Mindfulness is a bandwagon that I've happily jumped on recently. Its very trendy to practice meditation and mindfulness right now, but it is in fact something that has been practiced for thousands of years and I don't think it should be a passing phase for anyone. In short, mindfulness is a really simple type of meditation, that involves relaxation, breathing, focusing on any negative thoughts you may have and learning to deal with them before they have a more serious effect on you. Its a way of controlling your feelings and, ultimately your life, and in doing so leaning to be compassionate - to yourself as well as to others. Today's world is incredibly fast paced, which I think can sometimes have a negative effect on us all if we're not careful, children included. Daytimes are packed full of activities and technology, so it's important to me that the girls and I all take some time out to relax at some point. Our evenings have always been the time to reflect on the day and to wind down before bedtime. We have a no tech rule after dinner (that includes TV) and, even though the girls are getting older now, we still follow the traditional bedtime routine of dinner, bath, pyjamas, story and then sleep! Evie has now joined Daisy at school, which means lots of changes for her. Making new friends, learning new routines and new things in general, even just being away from home for six hours a day can all take its toll on someone so little. I hate to think of any child feeling stressed about changes in their lives, so I'm making an extra special effort to spend time with her, one to one, at bedtime. To talk about how school is going and to make sure she is happy and relaxed. I've started to stagger bedtimes so that Daisy also gets a bit of time with me once Evie is all tucked up and I have to say it's working really well. 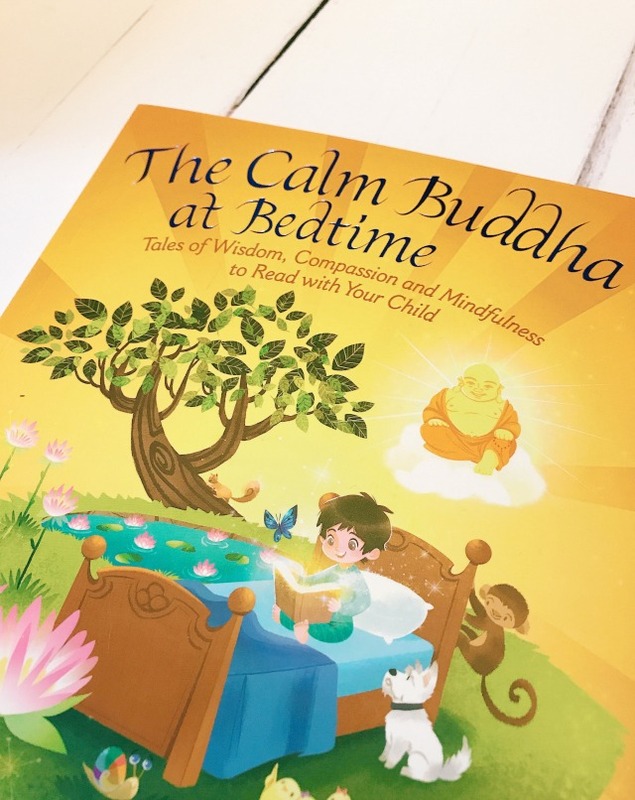 A new addition to the kids' bookshelf is The Calm Buddha at Bedtime by Dharmachari Nagaraja, a practising Buddhist for over twenty years and previously head of the Covent Garden Meditation Centre and a regular presenter on BBC Radio 2. He has put together a collection of eighteen ancient Buddhist tales that teach children about friendship, honesty and compassion. These particular stories have been chosen to reassure children about any worries they might have, to teach them valuable life lessons, to boost their self-confidence and to promote relaxation and prepare them for a good night's sleep. Of course they are also really lovely stories, with beautiful illustrations, engaging characters and good morals, all of which makes them perfect bedtime reading! We have been reading a story a night since the beginning of term and Evie loves getting 'the bedtime book' out and finding the right page to start the next instalment! Each story has a message and we like to take time to talk about them and relate them to every day scenarios once we have finished reading them. There's also a collection of mindfulness meditations at the end of the book that can be used at any time of day to help bring calm and contentment, and a bit more information on learning to mediate, which is great for first timers both young and old. I very rarely review books on the blog but this one (which we were very kindly sent by the publisher - thank you!) has turned out to be really special and I'd recommend it to any parent looking for something simple and meaningful to read with their children, particularly at this quite stressful time of year. Its available on Amazon here for £12.99.